Arborek is the name of a small island located between Mansuar and Fam islands. 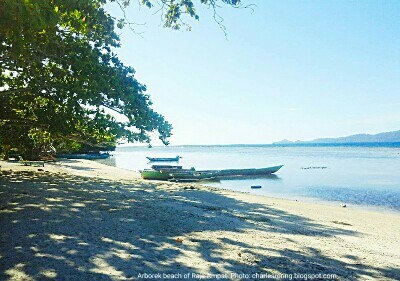 It is a favorite transit point for visitors who have just returned from Piaynemo or Fam islands. On their way back to Sorong city or to beach resorts and homestays in the nearby islands, they will stop for a while at the jetty of Arborek to enjoy snorkeling, buy some coconuts or do a short village tour. The jetty of Arborek is snorkeling and freediving site for visitors who want to see various colorful corals, sea fans, and fish. There are also some Giant Clam (Tridacna gigas) that are located in the shallow water, west of the wooden jetty. Although there is abundant marine life at the jetty of Arborek, villagers don't catch fish there for daily consumption. They go to the middle of the sea to catch pellagic fish instead. 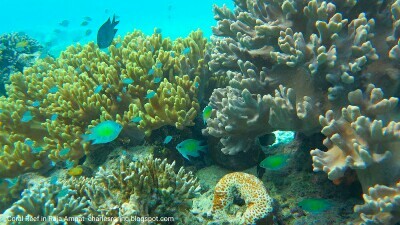 This is one of the most favorite dive sites in Raja Ampat. Here, scuba divers could watch a group of giant manta "fly" in circling formation at depths of 15 to 20 meters. While they move like that a lot of small fish that live in the nearby rocks will come out to eat dirts that attach on the body of the giant mantas. It is a symbiosis mutualism - mantas will have their bodies cleaned whereas the small fish get their free food. The best time to see manta is in the morning. It takes only 10 minutes ride by speed boat to reach the Manta Point from Arborek island. Snorkelers and free-divers can also see the manta but they have to be physically fit to overcome the sea current. Visibility is very good almost all months but July, August and September are the months where waves are bigger and the current is stronger. Please, check Google for such words as Arborek homestay, Worisun Homestay, Kayafyof Homestay, Indip Homestay, Manta Homestay, Bewas Homestay, Mawar Homestay, and Lalosi homestay. These homestays can organize your tour by boat to other places in the surrounding islands.